Web Werks has also been awarded 'the best web hosting award 2017', 'Retailer Of The Year For Best Cloud Data Centers And Internet Exchange', 'Great Indian Workplace Award (GIWA) 2017', and many more. Web Werks has further been honored by Government of Maharashtra with IT Excellence Award in the year 2018 and is empaneled with Government of India (MEITY) to offer cloud services. Web Werks Tally hosting services are often referred to as a business analytics platform that combines cloud, data insight, and unified decision support, along with your organization's most critical asset i.e. human intelligence. Web Werks Tally solutions are designed with beneficial features that are lightweight, super secured and seamlessly scalable. Web Werks Tally on cloud price includes RDP/Tsplus license with no hidden cost in the plan, True 3 copy SSD storage. Web Werks Tally solutions allow you to take the full admin rights over your server so that you don’t fall short on any authority or privilege issues. You can easily Start, Stop, Restart your Server. This extensive audit was conducted to validate if Web Werks Infrastructure and processes conform to SAP’s high standards and are suitable to host mission-critical environments running SAP applications. This certification recognizes Web Werks as having capabilities to sell and deliver Unmanaged and Managed Cloud Servers with high-performance Cloud Infrastructure Availability, Cloud Management, Cloud Security, Backup, and Disaster Recovery. This certification places Web Werks as a secure and reliable cloud service provider globally. With this Stand-alone well-equipped data center, the client in and around Delhi NCR, Gurgaon and Noida will now have access to quality data center and cloud hosting services delivered with the same IT Experts, acclaimed customer service and Rapid Action support that Web Werks is consistently delivering from the last two decades. The planned facility will be SAP Certified and also Carbon Neutral contributing towards Global Go-Green concepts. In addition to this, the Infra fulfills all the requirement for being a full OpenIX supporter. Web Werks is also Cloud empaneled by Ministry of Electronics and Information Technology, Government of India (MeitY). This High-density, Hyper-scale and Artificial Intelligence-powered data center will be built by Web Werks own core design & project team using innovative technologies and best practices for efficiency, high availability and six layered cybersecurity. A burstable Internet capacity aggregated from multiple ISP's offer content hosters and e-commerce organizations a robust, fast and cost-effective infrastructure to service their end users. A range of hosting services are provided by Web Werks which includes dedicated hosting, cloud hosting, virtual private servers, co-location services, disaster recovery - Work area recovery, IT infrastructure monitoring - management and Cloud computing services respectively. These services will be backed by the same automation tools and 24x7 customer service delivery provided at its other facilities. This data center features imposing of cybersecurity, ransom attack prevention program, Anti DDOS protection, Firewall network, making it a highly secured data center with monitoring and expanded infrastructure to support data center operations. Businesses today require a robust, reliable and resilient IT Infrastructure backbone. With our new data center, the city now has a promising state of the art destination for its IT Infrastructure requirements, and one that can abundantly address concerns of scalability, high availability, and resilience in the performance of hosted assets with unprecedented ease. said Nikhil Rathi, Director, Web Werks India Pvt. Ltd. Web Werks Data Centers have been leaders in India for the past two decades and are located in more than three countries with more than six strategically located data centers. Offering Reliable hosting services on Dedicated Servers, Cloud, Virtualization, Co-location, and Disaster Recovery Services along with 24x7 Rapid Action Support and 99.995% Uptime Guarantee. CMMI level 5 rating is the highest recognition to an organization’s software quality management system. For this certification, an organization needs to have a defined set of standard processes and institutionalization throughout the organization which means that the service or product that a client receives from the organization is of top-notch quality. A CMMi partner provides the CMMI certificate based on CMMI final Scampi appraisal. The appraisal was performed by KPMG India. Web Werks had to undergo an appraisal where an independent assessor with the internal team, carried out an assessment of the company’s capabilities. An appraisal of maturity level 5 indicates that Web Werks performance of the processes is well characterized, optimized. 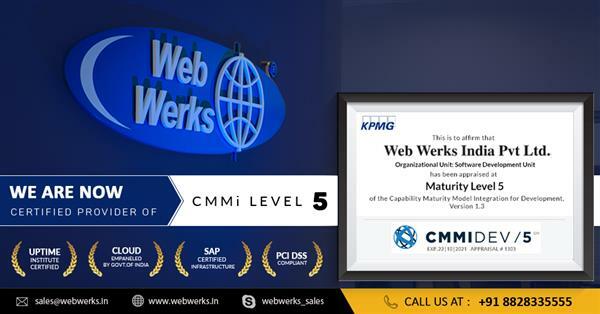 “We feel very delightful to receive the CMMI level 5 rating, this accreditation is a result of our continued focus on quality and innovation to deliver optimum business,” said Nikhil Rathi, Director, Web Werks. CMMI is a process improvement approach that provides organizations with the essential elements of effective processes that ultimately improve their performance and validates dedication to continuous improvement” said, Vijay Chauhan, HOD Quality Group, Web Werks. Web Werks Data Centers are validated with ISO 9001:2015, ISO 27001:2013, ISO 20000-1, 22310 and are Uptime tire 4 Certified. The data centers are Carbon Neutral contributing towards Global Go-Green concepts. Web Werks is also now SAP-certified provider of Infrastructure, Hosting and Cloud Operations Services. Web Werks had to go through an extensive audit to meet the SAP requirements. 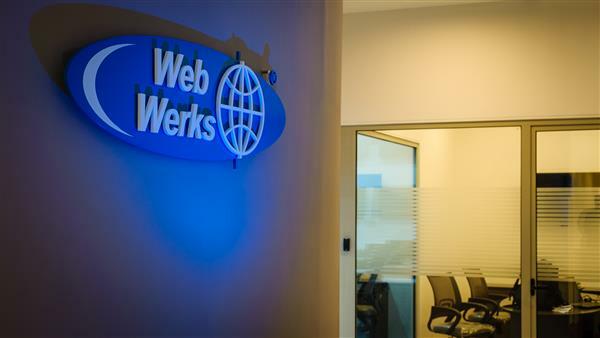 This audit was conducted to see if Web Werks infrastructure met SAP’s standards. To ensure ongoing standards for the management of SAP solutions, Web Werks Data Centers had to undergo a rigorous assessment of their delivery and support capabilities by SAP’s partner certification group. Web Werks Data Centers have been leaders in India for the past two decades and are located in 3 countries with more than six geographically located data centers. Offering Reliable hosting services on Dedicated Servers, Cloud, Virtualization, Co-location and Disaster Recovery Services along with 24x7 Rapid Action Support and 99.995% Up-time Guarantee. Web Werks Data Centers are validated with ISO 9001:2015, ISO 27001:2013, ISO 20000-1 and are Uptime Institute Certified. The data centers are Carbon Neutral contributing towards Global Go-Green concepts. Web Werks is also now SAP certified provider of Infrastructure, Hosting and Cloud Operations Services. Web Werks is also PCI-DSS, HIPAA, ISO 27001, TIA-942 and SSAE16, SSAE18 SOC 2 Type 1 compliant. This certification affirms how we treat security, confidentiality, integrity, and privacy of our customers data. Web Werks in India is the first Asian data center to hold OIX-2 and host an OIX-1 IXP Mumbai-IX. In addition to this, fulfill all the requirement for being a full OpenIX supporter. Web Werks is also Cloud empaneled by Ministry of Electronics and Information Technology, Government of India (MeitY). Cloudcomputing – broadly recognized by investigators and organizations as a noteworthy constraint in fundamentally modifying the whole IT scene, from how server companies are worked, to how programming is deployed, to how upgrades are handled, and much more. If your company is planning to convert to the cloud but then you are worried about the investments you have made in past for an IT infrastructure, this article will help you in cutting the risk while moving to the cloud. It will help in taking decisions about whether it makes sense to run those systems or workloads in the cloud or on your own data center. While shifting to the cloud, please do remember, you don't have to transfer all your data at a single time. It is not at all a compulsion! You can upload either half of the data on the cloud or opt for the full transaction. The best thing is that you can get back your data again whenever you need it back on your own physical server. In order to minimize the risk what you can do is that, tell your provider what exactly you are looking for! This will help him to design a solution that is exclusive for you while keeping your business need and budget in mind. 1. Security – Rest assured your data in the cloud will be much safer and secure compare to your desk. A high-security measure such biometric scanners, closed-circuit cameras, on-site security guards, coded access, alarm systems and more are implemented in the data centers. 2. Flexibility – If today you are transferring half of your data on the cloud, but tomorrow you decide to fully convert, then you can easily scale up to meet your companies requirement. Similarly, you can scale down if your requirements come down. 3. Cost Saving – Since there is flexibility option available you save money. Because to scale up, you don't have to plug-in extra hardware and in a case of scaling down obviously, you save! 4. Speed – The more we enter the digital world, the more we realize that speed is critical for decision making, whether positive or negative. Everything in cloud computing is associated and permits quick cooperation, changes are connected in the meantime sent and better utilization of time is likewise felt. Hope this article was helpful in abolishing the risk involved while shifting to the cloud hosting services. Do remember to be clear to your service provider what you need and your budget. This will help him to provide you with the best solution possible. 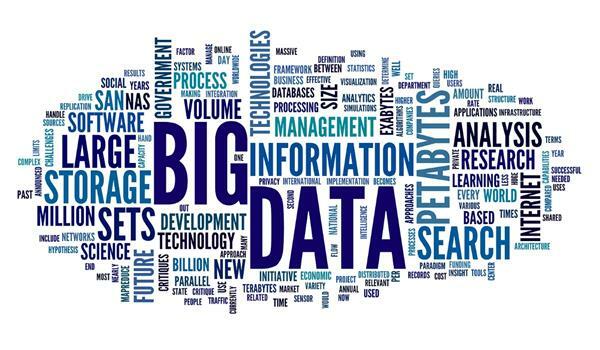 We've all known about energizing new innovations in the data warehouse world such as Amazon Redshift, Google BigQuery, and all the more as of late Azure SQL Data Warehouse. Obviously these are known as cloud data warehouse. As per Google, there are just around 300 individuals every month over the previous year in the whole world who scanned for the keyword "cloud data warehouse ." Whereas the search for the "Amazon Redshift" is sought 14,800 times each month around the world. Now that's a big figure, isn't it? I know it is not only the keyword to search for, people must be browsing with the words like data warehouse on the cloud. But as per experts who has done quite a few search in the field, they said that emphatically there are no bigger inquiry terms that depict the classification. Infact the classification itself has no existence. This may come as a interesting fact that the cloud data warehouse category doesn't exist. After all the market is hot, toolss are prominent and developing quickly. However, the truth of the matter is—the thing that goes to individuals' minds is the toolss, the brands; not the class. Sometimes it just clicks into our brain that rather than remembering the category of the product we just remember the label. Is it because they have been market so well or the name is easy to recall. Whatever may be the reason, it works for the brands. And category suffers, where in the brand earns. Similar is the case of Data warehouse. The technology has been here sinces ages, as far back as the nineteenth century Thomas Edison stored away the consequences of his electricity experiments in a (legacy) data warehouse, introduced on the profoundly adaptable Kinetoscope Platform in his Menlo Park research center. Indeed, there are! If you take a gander at the examination between "data center warehouse" and "amazon redshift". Redshift's 14,800 are a drop in the sea contrasted with "data warehouse." That term alone is looked 90,500 times each month all around, and there are numerous other related inquiry terms. "Data warehouse" is immense. Each month there are around half a million people, most likely wannabe data engineers, communicating enthusiasm for "data warehouse" or any variety of that. Contrasted with 38,000 hunting down Redshift, 26,700 for BigQuery, and a measly 13,000 for Microsoft's SQL Data Warehouse. A small number of individuals who opt for the search terms 'data warehouse' are now influencing their initial phases in the data warehouse world. They are searching for via this term because they want to learn essential things like what data warehouse are for, how they work, the amount they cost. However, their eyes are shut to reality of cool new items and structures. Not to thump these items, they're incredible. Be that as it may, what number of this crowd could be keen on the new era of instruments on the cloud with boundless adaptability and blasting quick question speeds? To conclude, we can sum it up by saying that evidently nobody knows about a classification called "cloud data warehouse". Bunches of individuals are more aware about the brands like Redshift compare to category. However, there are around 10X people who don't. They basically look for "data warehouse". Furthermore, what they get is old models and old-protect arrangements. Web Werks is an India-based CMMI Level 3 Web Hosting company with 5 carrier neutral datacenter servers in India and USA. Started in 1996, Web Werks has served several Fortune 500 companies with successful projects in the areas of Web Hosting, Data Center Services, Dedicated Servers, Colocation servers, Disaster Recovery Services, VPS Hosting Services, and Cloud Hosting. Internet of Things (IoT) is not just about connected devices, but it is more in connection with data storage. As our experts predict that 50 billion devices will be connected by 2020, it also brings with it a great deal of challenges and the major one is data. IoT machines perform a wide line of duty which could be as simple as capturing and uploading images on social platforms or transmitting more complex data to organization's different hardware components. There is more data to locate than you think and the data generated is usually categorized in two different types. The first type is large-file data that includes images and videos generated from smartphones, digital cameras and related devices, while the second type is small data, say, sensor generated log-file data. These small sensors is capable of developing billions of files that should be accessed randomly. Previously, it was such that a datacenter would store only one of these data types, so they were mainly involved with capturing image-based data. But with the change in the IT landscape and innovation in the sector, datacentersnow have to deal with both types of data and managed both on different storage systems. With all that, we've also seen a considerable change in data storage such as image-based data that was usually stores on NAS systems is being moved to object-based storage, while sensor data is moved to all-flash arrays for faster analytics. There are a variety of IoT devices and each one is designed and assigned a set of task, say, a health tracker is responsible of gathering health records such as heartbeat, number of steps, sleep pattern and so on. As a matter of fact, this device will generate a good amount of data as it will give you the health records and requires protection. Data produced from these connected devices also has an influence on data protection. Data protection is even more crucial than it for more legacy types data because there are certain data that can never be recreated and thus demands better security. What data to keep and what to get rid of? It all depends on what you need and what you're ready to dump. As aforementioned, your devices will generate an extensive amount of data and you have to choose which needs to stay. For instance, smartphone users need to decide what images and videos they should keep and what could be erased permanently. Similarly, organizations need to make a decision and think this through, but the decision should be made on long-term basis. This means that you avoid erasing data that you would have required for in future for reference. Most organizations might require that additional set of data that could be used for other services to make a difference in the future. The rage over the superiority of private cloud and public cloud will continue for years to come. In the meanwhile, hybrid hosting made its appearance in the market, which remained a buzzword for quite a long time, but not so long though. Organizations still wonder if hybrid cloud is the right solution for their hosting needs. Although business enterprises have made a huge progression in terms of technology by adopting numerous advanced techniques, but they step back when it comes to cloud services .The questions always arise in opposition that how hybrid cloud is better than private cloud and public cloud, individually. Each has its benefits. While private cloud provides full-fledged control and highest security standards, price might become an issue here. On the other hand, public cloud turns to be an economical choice, but can’t compete with the security features and flexibility of private cloud. That’s when hybrid strikes in; a combination of private and public cloud. The conventional set of web hosting serves its purpose, but when we compare it with the latest hybrid type, it is not as convenient and effective. Data distribution across two platforms proves beneficial in many ways. Most companies tend to locate their mission-critical data on private cloud, while use public for storage of non-confidential information. Such advantageous features don’t come in handy with the traditional hosting that earns votes for hybrid hosting. So the link between these two platform builds flexibility that enables organization to generate potential strategies. According to researches, hybrid cloud growth is estimated to reach $84.67 billion in 2019 and the advancement is expected to move upward. There are few concepts that you need to take into account while finding a cloud provider. Look into these three most crucial factors, security, connectivity and portability. Some companies have issues with security compliance, and other related important aspects and thus, it is essential to determine what the company actually abides by. From security perspective, the company must follow best practices to ensure that customer’s sensitive information is maintained safe. Connectivity and portability must provide the ability to move data and resources from private to public. Besides, the company should ascertain that sensitive data stays on the private server and is not transported to the public server. The ability to manage hybrid cloud efficiently without any added technical complexities is the key to a successful adoption. If service providers meet all the specific, users can experience highly effective hybrid cloud computing.